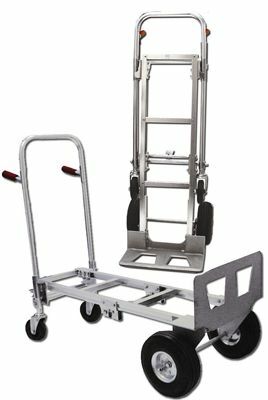 Hand Truck or Cart - You Decide! Perfect for delivery van or warehouse use, this aluminum convertible has 10" pneumatic tires at the nose and 5" swivel caster wheels on the other end. Double grip handles deliver firm control. Upright capacity 600 lbs. Platform capacity 800 lbs. 60"H. FOB Shipping Point.